Working bare-handed in the soil can be pleasurable. The feel of rich earth beneath the fingertips brings us in touch with nature. Wearing gloves sometimes seems like overkill. 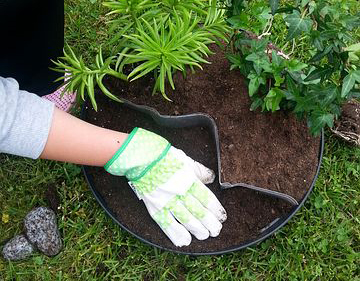 But there are good reasons to wear gloves as you go about your garden tasks. Some are obvious – pruning roses, for example – and some less so. The obvious reasons are to protect your hands from cuts and punctures and to prevent blisters and calluses. There are other reasons as well. Not all the organisms in soil are beneficial. Diseases and fungi can enter a cut or broken skin and cause illness. Outdoor cats may use the garden as a litterbox. Gloves also protect your hands when you are using chemicals. There's a bewildering selection of garden gloves out there. You can find cheap ones in the supermarket and expensive ones by specialist glove makers via mail order. I can't think of another gardening item I replace more frequently than gloves. Seems like the first things to wear out are the tips of the index and middle fingers of the right hand. 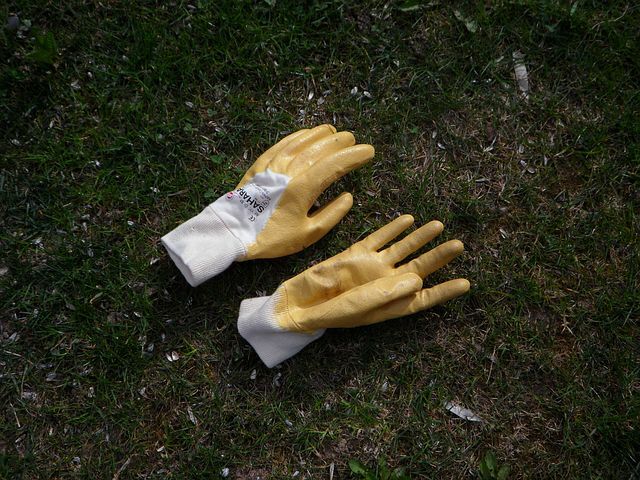 Padded fabric/synthetic leather gloves: My go-to pair, I wear these for the routine work of deadheading, cutting back perennials, digging, or weeding. They stretch and are very comfortable, and usually have extra padding at the fingertips and on the palms. They can become soggy when wet (though they dry pretty quickly), and are often not thick enough to stop sharp objects from poking through, especially at the back of the hand. Sometimes gloves like these are designed to be ergonomic. Nitrile or rubber gloves: Dipped in a waterproof material, these flexible gloves are the first choice for wet conditions. They don't breathe well, however, and your hands can get hot and sweaty. They also puncture rather easily. Leather or work gloves: For the roughest jobs. Padded or not, they are a tough layer between rocks, branches, gravel, and your hands. Good for any chore that requires coming in contact with unforgiving material. The leather or suede should be thick enough to prevent calluses and blisters. Downside: Even the best leather gloves become hard and stiff if they get wet. Thin, stretchy gloves: These look like the old-fashioned elbow-length gloves our mothers used to wear on formal occasions. These are for delicate work, when you need to be able to feel through the glove, such as when transplanting delicate seedlings. Many have little plastic dots on the fingers and palms for an improved grip. While they're comfortable and often come in fun, bright colors, these gloves are often so thin they're not good for much. I have a pair, but only wear them for the gentlest tasks, such as cutting flowers or deadheading. Rose gauntlets: These have a pretty specific use, though they can act as regular work gloves. 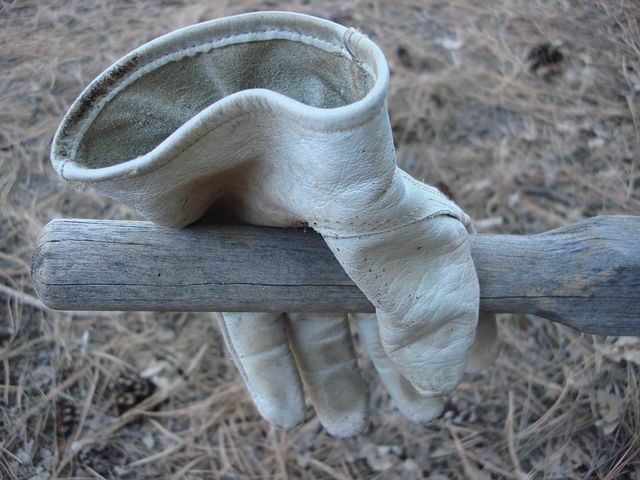 Usually made from heavy, thorn-resistant leather, with leather sleeves that rise near the elbow, you wear these gloves for the times you need to wrestle roses or other thorny plants, for planting, moving, pruning, or training. Some people swear by the cheap cotton gloves you can get at the dollar store. They just throw them away when they tear. But they don't offer enough protection for me, and it seems wasteful. Nowadays, many manufacturers take into account the differences in hand shape, and design different gloves for men and women. In my experience, unisex is shorthand for "we don't make gloves in women's sizes," and are designed for men. Some gloves are available only by mail order, but being able to try them on is preferable. Obviously the gloves shouldn't pinch or pull, but be snug enough to perform the tasks they are meant for without being uncomfortable. Try both gloves on. Make a fist, flex your fingers, grab a nearby tool or mime raking or digging to see how they feel in motion. Check for seams that chafe or fingers that are too long or short. The gloves shouldn't slip or be so wide around the wrist that dirt can get in. Some nice-to-haves include Velcro at the wrist to keep out dirt, and a clip that lets you hook the gloves together when not in use. Well-made leather and synthetic leather gloves have double seams on the palms and other places more likely to tear. If you do decide to try a pair via mail order, follow the directions on the site for size and fit. Don't just guess. A good glove supplier will have instructions on how to measure your hands and determine which size is right for you. Care of gloves Cotton, nylon and other types of fabric can usually be thrown in the washing machine on a cold cycle. Leather should be treated occasionally with leather protector to keep the gloves from drying out and losing their suppleness.